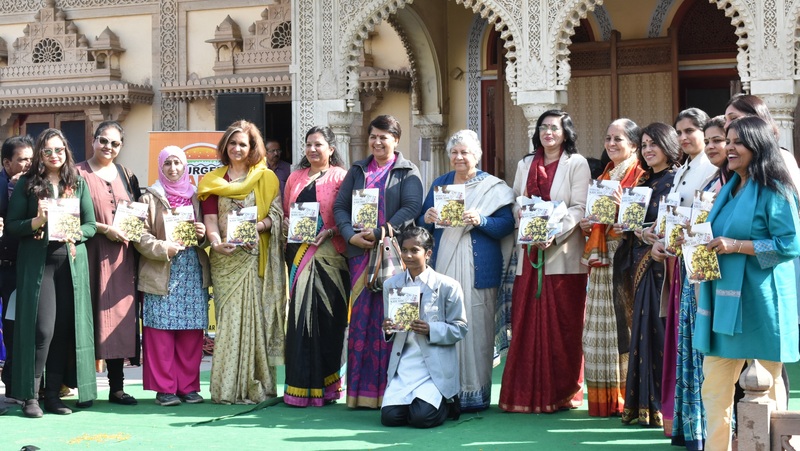 The book – ‘India Ki Khichdi’ was launched at the on-going ‘History Festival’ at City Palace. The book featuring 51 recipes of Khichdi from around the country, is based on a poster by Savita Tondwal of S.V. Public School. The recipes in the book have been developed by culinary experts ‘The Cauldron Sisters’ while the story has been written by Prashant Mishra. The 4-day mega festival celebrated history and its collections with as many as 1500 students in attendance from around 30 schools. Also, present on the occasion was Executive Trustee, MSMS II Museum, Ms. Rama Datt. The programme began with ‘Dua’ and ‘Raag’ by Madarassa Rehmani School and The Palace School respectively. This was followed by ‘Kabir Dohe’ by Subodh School, Airport and ‘Krishna Vandana – Tum bin Mori Koun Khabar le Gobardan Girdhari’ by S.V. Public School. The festival also showcased enigmatic plays like – Mughal-e-Azam by S.V. Public School wherein the students aptly dramatized the love triangle of Salim, Anarkali and Bahar. While Jodhabai tries to understand and take over the financial reigns. Similarly, plays –‘Varna System’ was performed by Subodh School Airport and Inquilab by Shanti Asiatic School. A colourful medley of dances were presented by the students of Disha who left the audience enthralled with their Sufi performance on songs like – Tujhe Yaad Kar Liya Hai, Jaise Chamke Damini and Piya Re. Not only this, students of Shanti Asiatic School presented a fusion dance with their rock band. The performance featured numerous classical dances of India such as Manipuri, Kathakali, Bharatnatyam, among others. Other than this, a mythological dance was also presented by D.P.S. Jaipur. Principals from various participating schools were also present on the occasions like – Ms. Anu Bhatia (St. Edmunds), Urvashi Warman (The Palace School), Kayanat (Madarassa Rehmani School), Rekha Yadav (NIMS International School), Ms. Rita Taneja (S.V. Public School), Nilima Sharma (Shanti Asiatic School), Ms. Svetika Jain (Malviya Convent), among others.